This may sound strange to a great many people out there, but American film used to have a certain tone or tenor distinct not only from other world cinema, but from other American arts. If you watch a great number of American films from the 30s and 40s (and even onto the 50s and 60s), you'll find a cinema defined by work, work ethic, and how our work becomes our lives, on making your own way in the world but unable to resist the call of love when it finally comes knocking, and on achievement, some sort of sign that you've succeeded in this life, however small. This is also a cinema that America has almost given up on, even though the way we make our lives has changed very little. If it does find its way into popular entertainment, it's always in the refuge of the "chick flick," which manages to produce maybe one quality film a year if we're lucky. Now we're stuck in a system that mainly allows for the occasional auteur statement amidst a sea of multinational product, the kind of film that feels vaguely American, but isn't so specific that it can't be sold overseas. The closest America has come to a distinct cinematic voice is a sort of hipster/twee/ironic cinema that takes its cues almost entirely from music (literally and figuratively, in films such as (500) Days of Summer, Away We Go, Juno) alongside the Apatow child of "bromance" - each suggesting our relationships are the thing that primarily consumes our time, when in reality, as they said at the training for my latest job, "we spend more time here than we do with our friends and family." 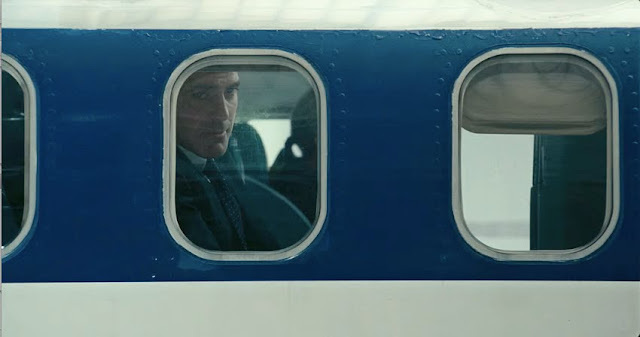 So there's tremendous relief for those of us passionate about distinct, classical American filmmaking in viewing Jason Reitman's Up in the Air, not just in how fine it is but in how honest it is about the decisions and situations put before us, and how we approach those. Reitman has made a film that is monumentally important for what it says about who we are, what we want, and finally, what we have to make that from. It's also a fascinating study in the delicate balance of creating perfection, and how quickly that can all tumble. Minor spoilers follow. Let's start with the perfect, some of the finest character-building I've seen all year in American cinema. 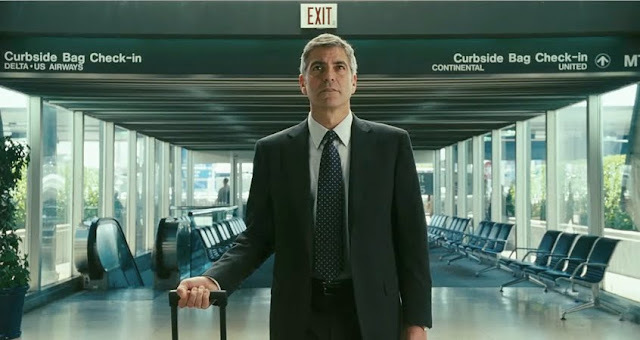 Starting with archetypes (George Clooney as the couldn't-be-happier-to-be-single jetsetter who is about to undergo a major change in priorities, Vera Farmiga as the woman who can play tough with the guys, and maybe a little too tough, and Anna Kendrick as the career-focused recent college grad), Reitman and cowriter Sheldon Turner deconstruct these people slowly, and just subtly enough to be obvious, but without having them just say it. When Farmiga says towards the end of the film, "See, you don't even know what you want," we realize that, because of everything Ryan (Clooney) went through to get to that point, he knows exactly what he wants but is far too proud and/or embarrassed to admit it. Ryan is the modern man - savvy, smart, self-centered, and (as we would all like to be) in love with his work. Or rather, in love with the circumstances surrounding his work - air travel, hotels, the illusion of V.I.P. status that comes with spending a lot of money to earn it. The modern man (Ryan as our surrogate) has actually accomplished very little, but is continuously rewarded for it in completely meaningless ways (cutting to the front of the line, special frequent-flyer cards, a pre-programmed greeting). And, like most modern men, he has no idea how to fit women into this worldview. It's one thing to say, "we're all equal," but in cinema that so often comes in the tired form of a woman written exactly like a man. What makes Alex (Vera Farmiga) so compelling is that she is resolutely feminine, and her certainty of this in the "What Happens in Vegas" era makes her Ryan's equal. Watch Clooney in the scene in which Alex consoles Natalie (Anna Kendrick) after her boyfriend breaks up with her - his quick changes between fascination, attraction, and discomfort are the work of a marksman who knows secretly that he is the target. Modern man's other challenge comes from the young, represented here by Natalie, the other side of Alex's coin (where Alex's certainty of her womanhood makes her strong, Natalie tries desperately to position herself as masculine, which becomes her undoing when genuine feminine impulses take over). Natalie's ultimate challenge to Ryan is the willingness and ability to streamline the skill in his line of work, which has taken a lifetime to build, into a flowchart and iChat. Like most men of his generation, and by birthright men in general, Ryan is completely unable to keep up and takes offense almost by the mere gesture. And so he fights back, sometimes directly (in the "fire me" scene), and sometimes abstractly. Modern Man is increasingly battling his own irrelevance as a distinct gender, and the ways in which he tries to compensate for this feeling are insignificant in their nature, and pathetic in their representation - Ryan's goal of ten million frequent-flyer miles wouldn't be so empty were it not for the pride with which he sets out on this mission, not unlike the notches on one's bedpost. If all this seems rather lofty for a movie about "The story of a man ready to make a connection," as the advertising material for the film claims, it's not only because these issues are woven into the fabric of the story, but also because Reitman's one major, destructive flaw in the film is so blatantly calling attention to them. In some films, you'll see these tracking shots that follow a character for several minutes at a time, and anyone who's been a part of them will invariably talk about the anticipation and nervousness one feels towards the end of the shot, when the slightest mistake by the lowest-level crew member can destroy hours worth of work in setup and execution. Watching Up in the Air is like that. It's such a rewarding film, so delicately written, with truly compelling characters and a fascinating, timely story, you really wonder if it can make it. And it almost does. Then, right at the very end, when we're reaching our emotional climax with Ryan, Reitman inserts some interviews he did with people who were really laid off, and how they wouldn't be able to make it through anything in their life, big or small, if not for their loved ones. Okay, at this point, this is something Ryan is realizing all on his own, and is about to state it through voiceover. The interviews are not only unnecessary, but actually destructive to the film, and anyone who insists that a small fumble cannot undo a great film needs to come around to the fact that films are not a series of moments - they're a whole piece. What happens at the beginning should affect the end, and what happens in the end should affect the middle. Everything matters, and because Reitman's grand fumble takes place at such a crucial moment in the film, the film becomes 1/10th as good as it would've been without it. That said...that 1/10th is still very impressive stuff. It's expertly written, with an ear for the different ways people express themselves through speech and the application of this at work, in relationships, between acquaintances, and amongst family. It keeps an eye out for who we are in those different situations, and how we adjust and change who we are to suit circumstance. Clooney's rarely been in better form (but, to be fair, Michael Clayton also asked a lot more of him), this will hopefully be the film that puts Vera Farmiga over the top, and after a solid debut in Rocket Science, Anna Kendrick seems to have really found her footing and is off sprinting. I barely touched on the relationship aspects of the film, which are wondefully addressed in sort of calling out the silliness of the trepidition with which we approach romance (the aversion/encouragement of labels, the uncertainty of one's place in a new person's life, the arbitrary rules preceding intimacy) while at the same time celebrating the exhilerance implicit in such an endeavor. I guess it's just that the film makes such a big, obvious point of it all that, even though it's done quite well, I felt little need in talking about it. It does please me immensely, though, that this film feels like Reitman's first grand achievement, after his thoroughly entertaining debut with Thank You for Smoking, and his very earnest, honest, but ultimate stumble with Juno. Up in the Air is a marriage of those two intents, and incredibly successful at that. is right, our job becomes our life and so we have to do the best we can!